Culottes, gauchos, palazzo pants -- the warm weather seasons are all about the new loose fitting trouser. Styling these pants can sometimes be a challenge, but it doesn't have to be. Because the silhouette is long and loose with a wide leg, this piece must be balanced out. A pair that cinches at the waist is key. Add a high heel, a fitted top or layer with a cropped jacket to keep your volume wearable for every day. 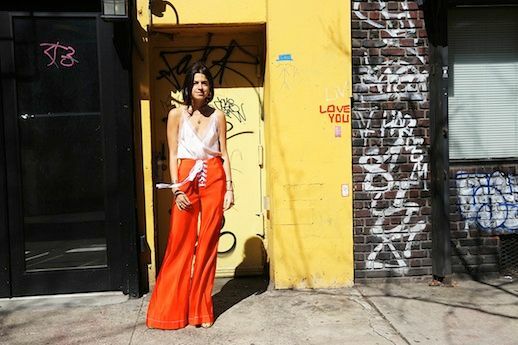 Leandra Medine styles her Rosie Assoulin palazzo pants with a simple silk cami top and an assortment of gold jewels.